Born in Turin (1990), she graduated in Architecture at the Politecnico di Torino with the thesis "Through a Beijing fragment. The danwei of Textile Factory" in collaboration with Tsinghua University. She is currently a Ph.D. Candidate in Architecture, History and Project at Politecnico di Torino, where she explores recent urban transformations of the Beijing historic city center related to the topic of urban acupuncture and creative processes. Both these experiences have been the perfect field to test different tools and lens - from drawing to photography and video - reflecting about the possibility of framing the gaze on time and space while moving inside the city, structuring a work which has a strong connection with "urban ethnography" researches. Member of the China Room and the SCTCL, she’s involved in projects and installations. Over the years she collaborated as teaching assistant in between Politecnico di Torino and Politecnico di Milano, approaching different issues and experimenting various didactic methodologies in both architectural composition and urban design. 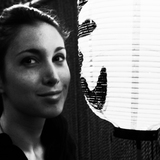 As a freelance architect, she is involved in mixed research+design workshops and competitions.